Welcome to Baden-Baden’s municipal recreational forest and to the North/Central Black Forest area of outstanding beauty (“Naturpark Schwarzwald Mitte/Nord”). From the Tiergarten trailhead there are a variety of paths and circular routes offering fantastic views. 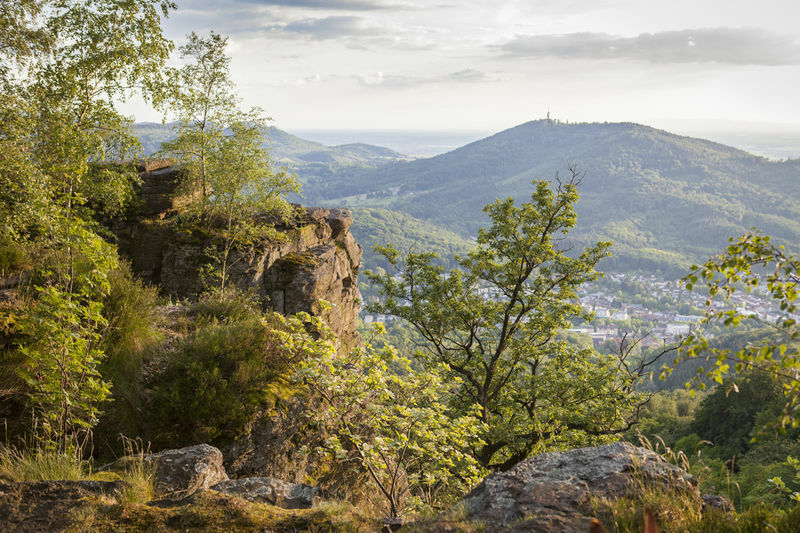 Taking the trail called Korbmattfelsenweg you’ll reach the Korbmattfelsen rock outcrops and Waldhaus Batschari, a large woodland shelter. From here you have wonderful views of the spa town of Baden-Baden in the valley below with its expanses of parkland and gardens. The route to both vantage points is via narrow trails along the steep sides of Korbmattenkopf. These paths take you through a landscape that has been shaped from the hard volcanic porphyry rock. Steep-sided valleys, ravines and rocks dominate the scenery here and mean that agricultural land-use is impossible. But the flora of the forest is varied and home to many different species. On the south-facing slopes you’ll find dry oak and chestnut forest. If you come here in autumn you can fill your pockets with chestnuts. In contrast, species-rich forest typical for ravines with sycamore, lime and wych elm are to be found in the damp hollows. Silver ragwort and rare types of fern decorate the forest floor. Fremersbeg mountain, accessible via a circular route, provides a contrasting picture. Fremersberg is soft red sandstone, resulting in much gentler contours. 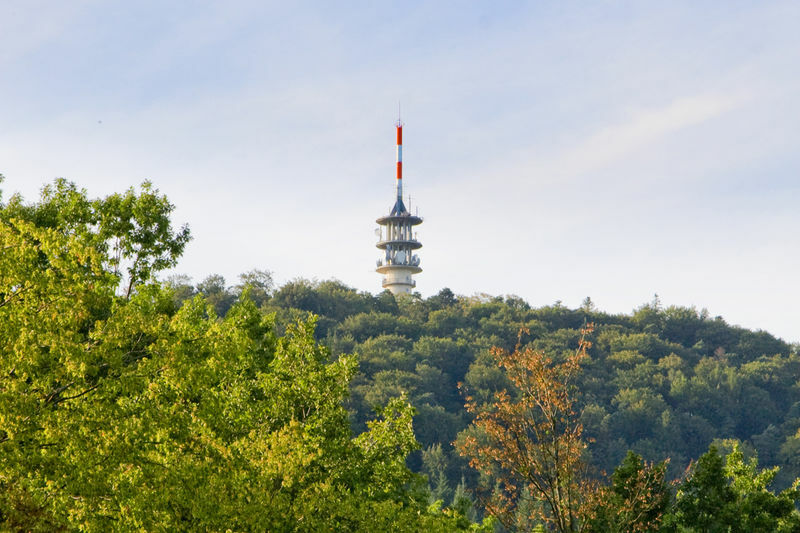 The mountain is the western most summit on the flanks of the Black Forest and so on clear days has spectacular uninterrupted views of the whole Upper Rhine valley and the mountains of the Palatinate Forest, the Odenwald and the Vosges. 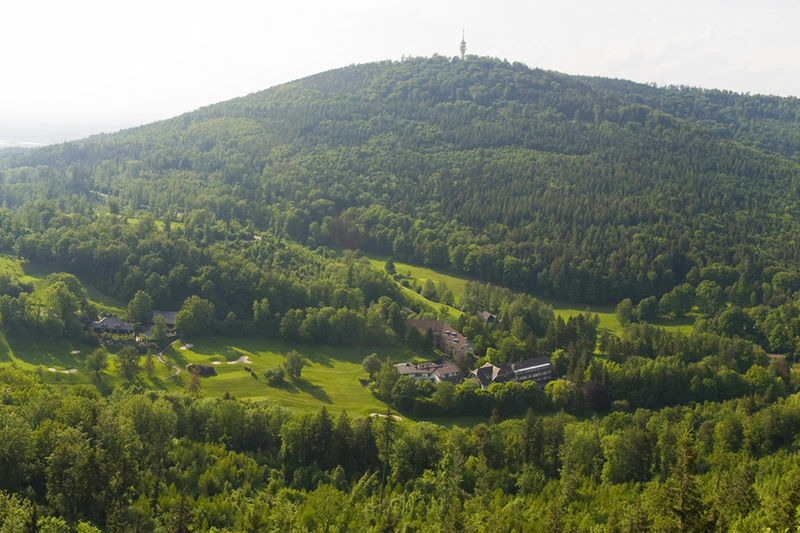 The panorama stretches from Donnersberg, a peak in the north near Alzey, to Grand Ballon in the south, the highest mountain in the Vosges, near Mulhouse. The name Fremersberg comes from Pfrimmen, an old German word for broom. It is assumed that as little as 300 years ago the mountain was covered in broom rather than trees because most of them had been lost as a result of large-scale cattle grazing and duff harvesting, the collection of decomposing leaves to be used as fertilizer on fields. Korbmattfelsen-Rundweg, circular route: 4.5 km, total ascent 180 m: Tiergarten - Dr. Schlapper Weg (path) - Hirschbrünnele (natural spring) – Korbmattfelsenhütte (shelter) - Waldhaus Batschari (shelter) – Tiergarten. Up Fremersberg: 8.8 km, total ascent 380 m: Tiergarten - Golfplatz (golf course) - Fremersbergturm (summit tower) - Fremersbergweg (path) - Bildeiche - Droschkenweg (path) - Pulverstein (crags) - Katzenstein (crags) - Waldseen (lakes) - Michelbachtal (valley) – Tiergarten. Beutig-Rundweg, circular route: 9.0 km, total ascent 260 m: Tiergarten - Michelbachtal (valley) - Waldseen (lakes) - Friesenberg (hill) - Stourdzakapelle (chapel) - Trinkhalle - Kurhaus - Lichtentaler Allee - Gunzenbach (valley, uphill) – Wasserbehälter (covered reservoir) - Waldhaus Batschari (shelter) – Tiergarten. 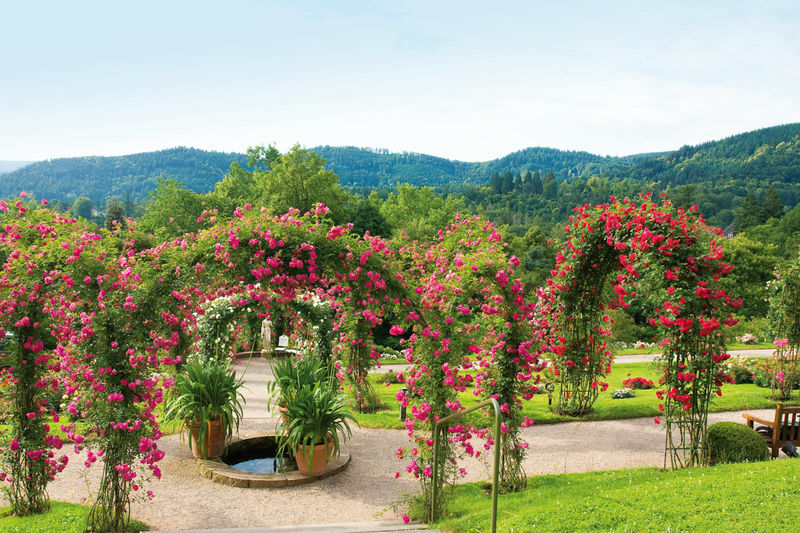 The "Panoramaweg" is a 40km-long circular trail around the town of Baden-Baden. It comprises four sections which, depending on fitness levels, can be walked individually or combined. From Tiergarten trailhead the road Moltkestrasse takes you to the Beutig new rose breeds garden. Over the hill called Michaelsberg you can continue to the centre of Baden-Baden’s spa heritage with its Kurhaus for entertainment and Trinkhalle where the waters can be sampled. Alternatively, you can take the opposite direction and walk via Korbmattfelsen (rock outcrops), Batscharihütte (shelter) and Louisenfelsen (rock outcrop) to Geroldsauer Mühle (shops and restaurant).